It is a busy time running the Party Bus Company. Luckily I have a great team to support me and with everything that’s going on behind the scenes, I unfortunately no longer get out to conduct on our Party Buses as often as I would like. However, last Saturday night, that all changed. 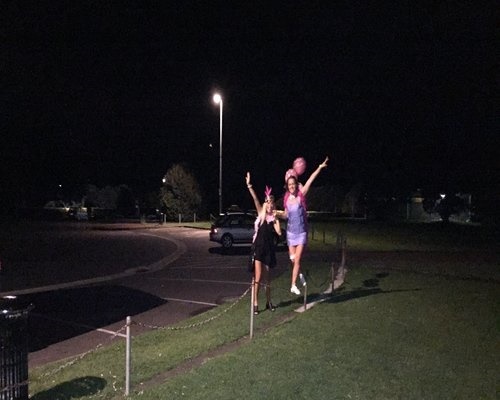 Normally, if I am out in the evenings, it would be at one of our fixed venue based events like the Avondale Events Centre (Boogie night’s) or at Markovina Estate (our family business). However, last Saturday one of our conductors sprained her ankle and was not able to make it in that night and to top it off we were fully booked, so all conductors we were already out. It’s moments like these that you have to pull things together last minute, so in order to keep the party running, I jumped on board as the Bar Manager on the Premium Party Bus with only an hour or so to spare. 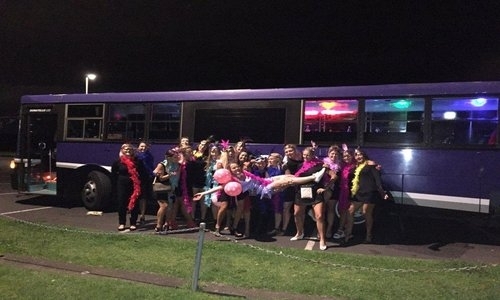 The Premium Party Bus is the entry level of our licensed vehicles, however entry level does not mean lacking in fun or atmosphere and the girls proved that by having an amazing time. 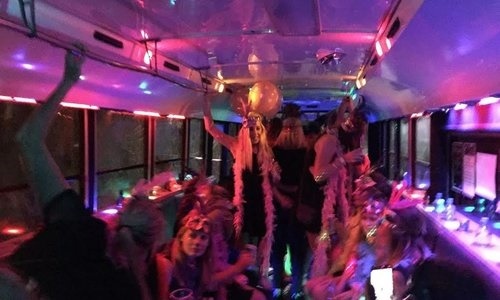 You get 20 girls together, in a party themed bus to celebrate their best friend’s hen’s party and you know it’s going to be a fun night. We arrived nice and early for the pickup up and I introduced myself to the organiser and told her we were ready whenever they were. Our Premium Party Bus is our only BYO vehicle and included is our service of their drinks and this was my job for the evening – Bar Manager. The driver and I loaded the drinks for them as they got everyone ready and on board to leave. Then we were on our way. 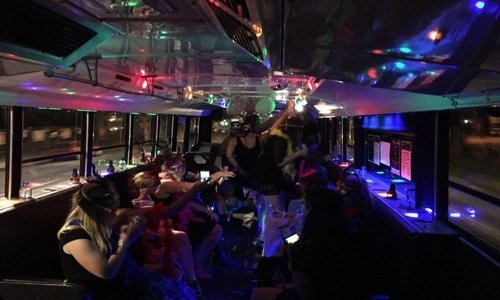 The first thing I heard from a number of the girls as they climbed aboard was that the bus was awesome, and you could tell they were ready for a great night! As fully organised girls, the group had arranged their own music for the night via an iphone. However, I already had music pumping when they boarded and they didn’t change this for quite a while so I can only conclude that I chose well. Our first organised stop was Bastion Point, a great opportunity for a photo shoot and it was here that my role merged into photographer as I was given a countless number of cell phones to take various photos on. During the impromptu photo shoot with my attention focused on the group posing for photographs, I missed what would have been a great photo opportunity. One of the girls cart-wheeled behind me, in perfect form and this is after a few drinks. Having missed that shot I did make it up by catching the “hen’s” skill in walking the tightrope! 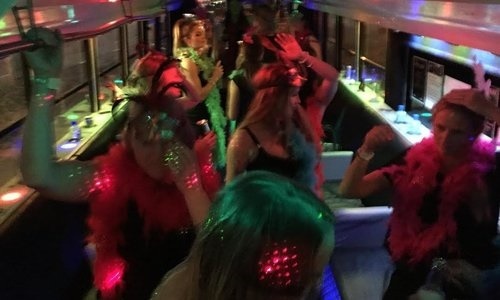 With the sideways seating and social atmosphere the Premium Party Bus proved to be the perfect private venue for our girls and contributed to the fun, conversation, drinks and the ever changing cityscape views. Next we were off to Mission Bay and another great photo opportunity. 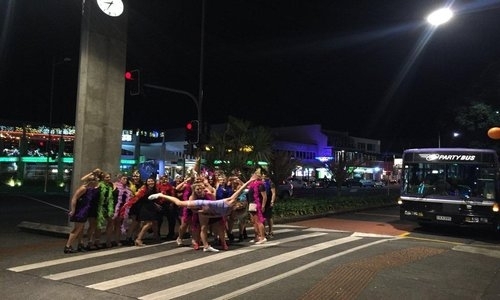 Even the driver managed to get a photo with everyone and then it was off to Takapuna where the group spent the majority of their time, including the ‘must do’ hens’ party games and competitions. All in all the girls had a blast and celebrated their friend’s upcoming nuptials in style with plenty of focus on fun. 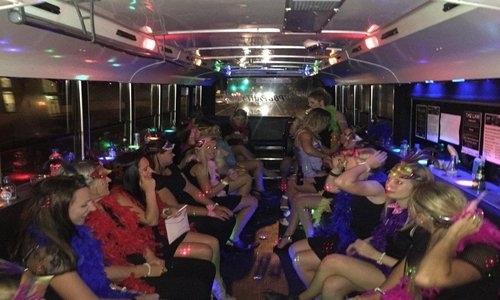 All groups we encounter at Party Bus come for different reasons, have varying tastes or preferences but all want to, and do have, an amazing night. Whether for a Hen’s night, Stag night, 21st Birthday or 50th Birthday celebrations, we have the party coach to fit your needs. From BYO in the Premium Party Bus to fully hosted VIP glamour in the Viper – whatever your needs… we can meet them. To book your friends upcoming Hen’s Night, give us a call, We are more than happy to answer all your questions or queries. It’s what we love to do. We constantly deal with bridal or other party based events so more than likely we will know what you want to ask even before you call. Simply pick up the phone and let us help you figure out the rest.